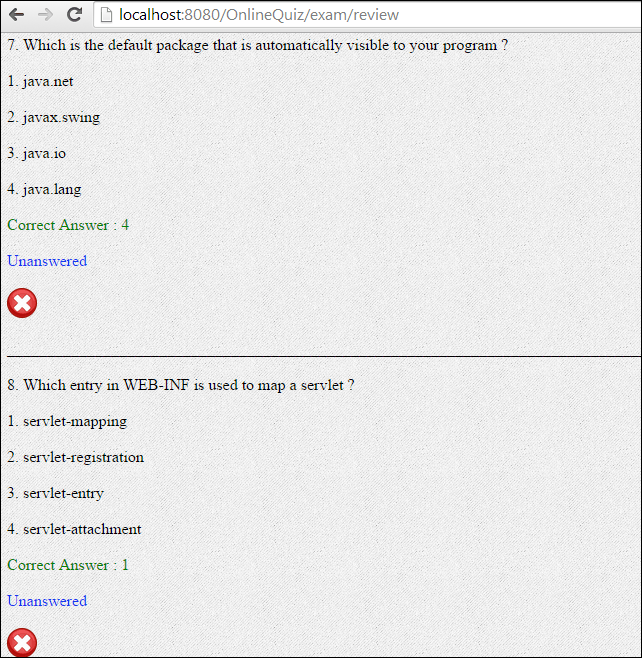 This is the third post in the series of creating an online quiz application using JSP Servlet. If you haven’t read the previous posts please go through it, as that will make it easier for you to follow this post and understand it completely. 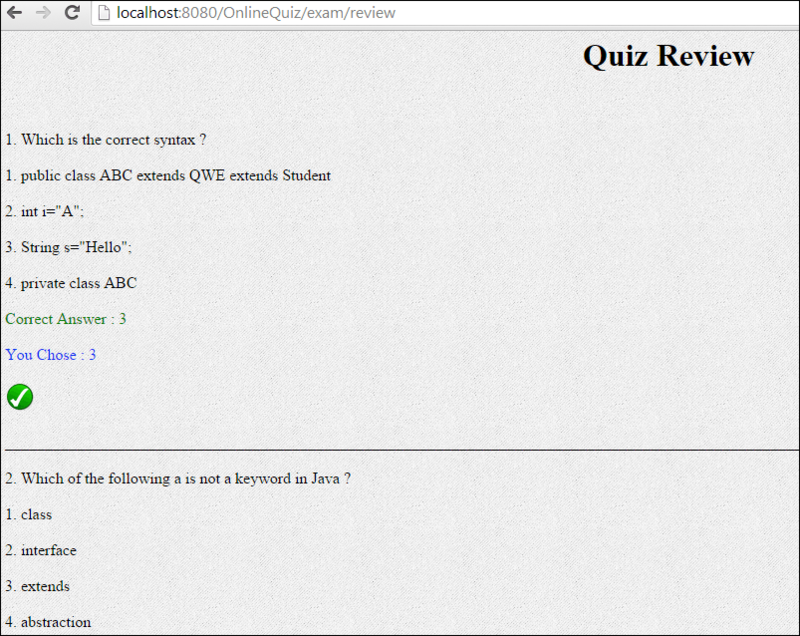 Below is the snapshot of the quiz result page created. What else do we require to get the review functionality working? The user can finish the quiz anytime, on finishing the quiz , he will have the option of reviewing his answers. If the user does not answer a question and skip it by clicking on the next button then that question will be shown as unanswered on the exam review page. To provide the user the summary of the quiz, all we have to do is to save the user responses and when he finishes the quiz compare it with the actual answer of the question. If the user’s response matches with the correct answer of the question, then we display the correct symbol else cross (x) symbol. 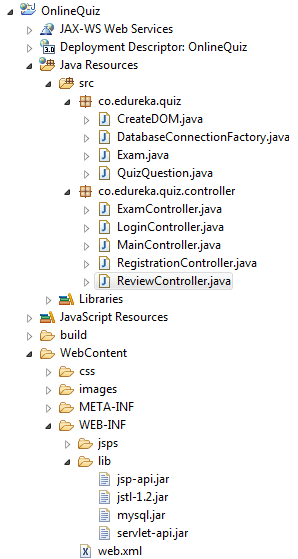 We will add a new controller called ReviewController, which will extract all the data and send it to a JSP page to show. Note : We are fetching questions from the XML file when the user clicks on the next or the previous button. Suppose a user starts a quiz and attempts only one question and then clicks on Finish button. Now, on the quiz review page we have to show all the questions with its options and the user’s response whether it was correct or not. Since in this scenario the user does not complete the entire quiz, the rest of the 9 questions will be shown as unanswered. So when the user clicks on Review Quiz to see his responses along with the correct answer for that question, we have to fetch all the questions from the XML file and its correct answer. Note: We have just included one new controller ReviewController. Note: I have set all the required information in an ArrayList of QuizQuestion and set that ArrayList as an attribute in request scope. 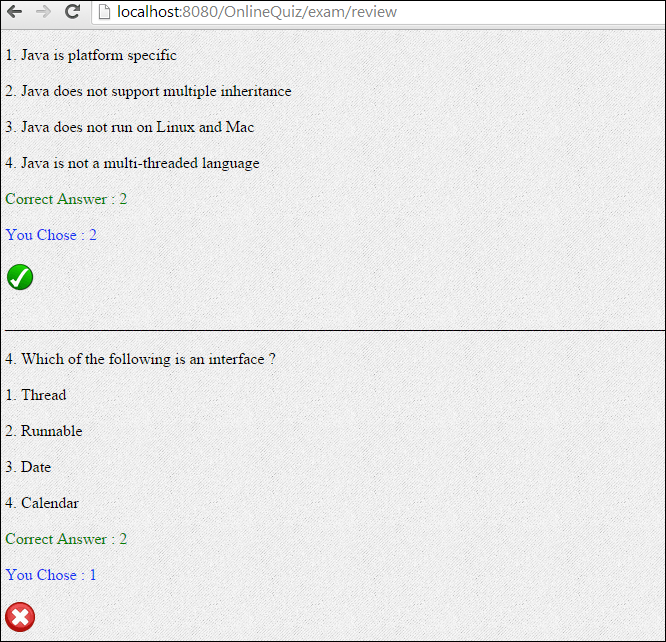 In the JSP Page we have to just retrieve the values stored in reviewQuestions attribute. 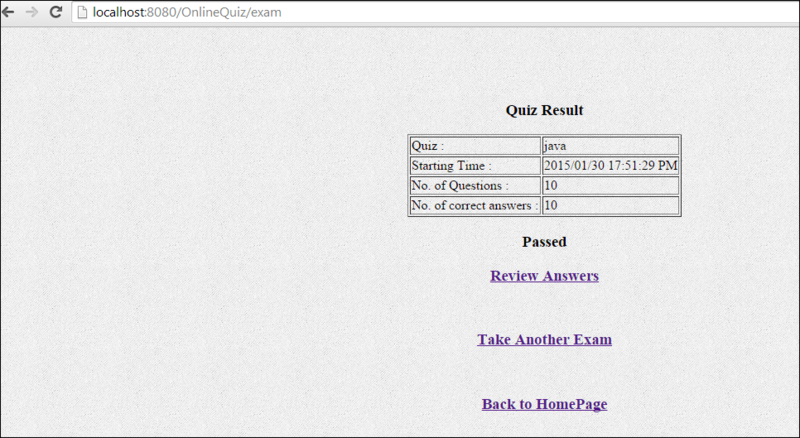 I have created a JSP page called examReview.jsp, which will show the quiz summary. Note that in XML file I have stored options starting from index 0. That’s why we added one while showing the correct answer to the user, as that is intuitive to the user. It’s not mandatory for the user to attempt all the questions. He can just skip it by clicking on the next button. So how do we find out whether a question was answered or not? I have made one change in the Exam constructor, so that when we create a new Exam, for each question we also set the user’s response as -1 initially. So, when the user starts the quiz we will have the user selection for each question even if the user just clicks on the finish button on any question in between the quiz. But if the user actually answers a question then -1 will be replaced by the user’s selection for that question. So if the user does not answer a question and skips to the next question or just clicks on the finish button, the initial response of -1 will be there. In the JSP page we can compare whether the user selection is -1 or not. If it is -1, it means the user did not answer that question. And we will mark that question as unanswered. If the user actually answered a question the initial response of -1 will be replaced with the user’s response and it will be replaced with 1,2,3 or 4, as we have 4 options for each question. We are making a c:if test to make sure the user actually answered a question and then display the user’s response. If the user’s selection and correct answer for the question matches, we display an image showing a correct mark. A simple c:if test is made to compare the user’s response with correct option of the question. If both are not equal it means the user answered the question incorrectly and we display an image showing a cross mark. Click on the download button to download the code.